Indulge in the excitement of urban living at Camden South End. Perfectly situated in the heart of Historic South End and on the edge of Uptown, our studio, one and two bedroom apartment homes are just steps from the Carson Street Light Rail stop. Our premier location puts the best in Charlotte dining and entertainment at your fingertips. Sporting events are right around the corner at Bank of America Stadium. 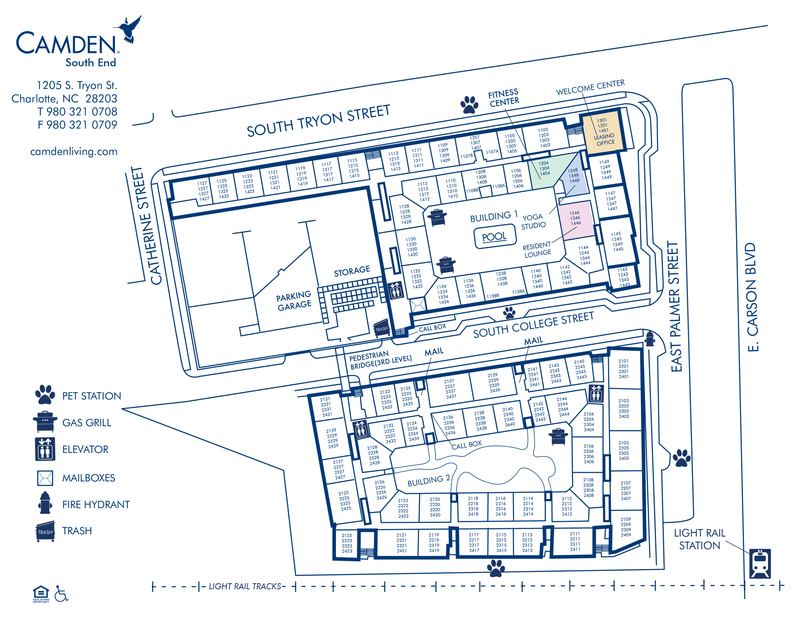 Come home to Camden South End after a fun filled day and enjoy every detail of your apartment home. Our newly remodeled interiors feature crisp white cabinets, beautiful gray Caesarstone quartz countertops, Arctic White subway tile backsplash, large rainfall showerheads, upgraded stainless steel appliances, modern ceiling fans, LED lighting, USB outlets, Lyric Pro Thermostats and more! Ready to call Camden South End home today? The perfect accent to your life on the edge of Uptown are the luxury details such as kitchen islands, walk-in closets with custom built in storage systems, gas fireplaces, built-in bookshelves, and computer niches. Being a homebody will be easy with amenities like our resort-style saltwater swimming pool, expansive fitness studio, and billiards lounge with flat screen TV and gourmet kitchen. We’ve even thought of added conveniences, so you don’t have to, like our doorstep trash pickup, reserved parking spaces, dry cleaning service, and access to B-Cycle bike station. Camden South End is also currently in process of becoming a completely non-smoking community. Make Camden South End your new home and enjoy the good life in the heart of Historic South End Charlotte. At Camden, your pets are family too! We welcome cats and dogs, up to two pets per apartment home with no max weight limit. Call us with any pet-related questions! Get the perfect spot! We have ample parking for our residents in our parking Garage on a first-come, first-served basis with up to two spaces per apartment home. We also offer reserved parking for $40 per month per space. Visitor parking is available in front of the access gate in designated spaces with a visitor pass.